Apart from the usual top dogs, Firefox and Chromium, an overwhelming number of web browsers exist for Linux. Some of them satisfy rather unusual needs, such as pure text representation of sites, which is what Lynx and ELinks are all about. If you find Firefox too bloated and Chrome too intrusive, however, give the newcomer QupZilla a whirl. Although the QupZilla project is a mere three years old, binary packages are already available in many software repositories. You can install the browser with a few clicks in Mageia, Fedora, openSUSE, Debian, Ubuntu, and Arch Linux from the official software repository. The current version is available precompiled on the project website. After a successful install, you can launch the browser from the HUD. QupZilla starts up quickly and leads you to an unobtrusive startup screen reminiscent of Firefox (Figure 1); however, it relies on the DuckDuckGo search engine instead of NSA-friendly Google. Figure 1: QupZilla opens up with its default settings. The enormous speed of the browser derives from the Webkit rendering engine that allows fluid surfing even on less powerful hardware and eliminates stuttering when scrolling. QupZilla's external look and user experience are closely modeled on Firefox, and it fits seamlessly into any existing work surface because of its Qt library base. Newcomers require no further training (Figure 1). QupZilla integrates and activates the Adblock ad blocker that needs to be configured in a somewhat unusual dialog. QupZilla then sets the browser into a private mode, when a new window opens while the original one remains. QupZilla also uses the well-known tile (here called Speed Dial ) view of Opera and Firefox that presents the recently visited web pages as miniatures on new tabs so that you can quickly visit them again. 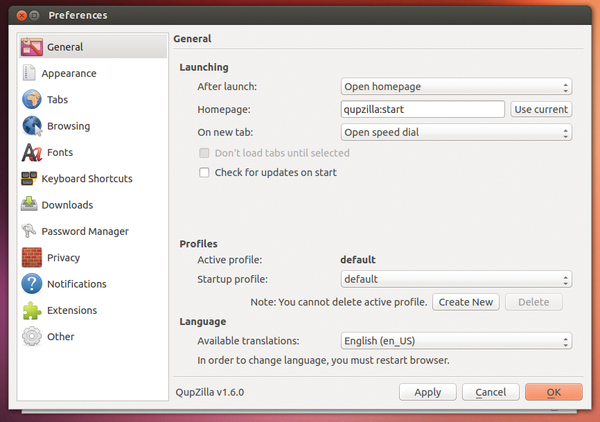 Despite its similarities to Firefox, QupZilla has a settings menu that deviate from Firefox quite a bit. You get to the settings from the horizontal menu bar with Edit | Preferences . A new window appears with several options in the left pane to customize your browser. In the larger pane on the right, you can actualize the settings. QupZilla then partially groups the setting options in the right pane into horizontally arranged tabs (Figure 2). Figure 2: You can configure your browser in one clearly arranged window. In QupZilla, the subgroup Appearance includes a selection of five themes with which to customize the browser. To activate one of them, click it and confirm your choice with the Use button at the lower right. 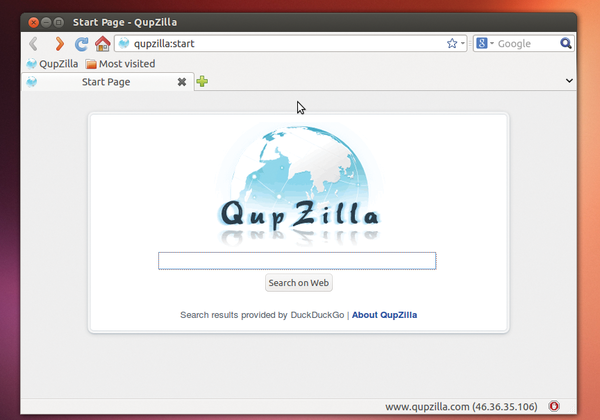 QupZilla then changes the browser appearance immediately without a restart. With the Other preferences, you can freely configure the icon and menu bars so that the browser can be in more of a kiosk mode with limited controls visible. Additionally, you can set the tab and address bar configurations just as freely from the Tab submenu. QupZilla allows you to hide certain resource-demanding content, especially for slower computers, such as Flash animation. In the Preferences | Other window, go to the WebKit Plug-ins tab and enable the Allow Quick to Flash , where you can define a whitelist of unblocked Flash addresses. Similar to Firefox's widely used Flashblock add-on, QupZilla then shows only Flash videos in a frame from websites with the Flash icon. To view the contents, click the icon in the frame and only then will QupZilla load the data. If QupZilla happens to crash during a session, it tries to recover all the previous tabs. You'll get a message with a list of recently opened tabs, and you can choose the ones you want to recover by entering a check mark. Google Chrome constantly "phones home." With a little effort and the appropriate add-ons, however, you can prevent transmitting unwanted data.